Hey Tampa, Lisa here with an update from one of our venues in Ybor City! 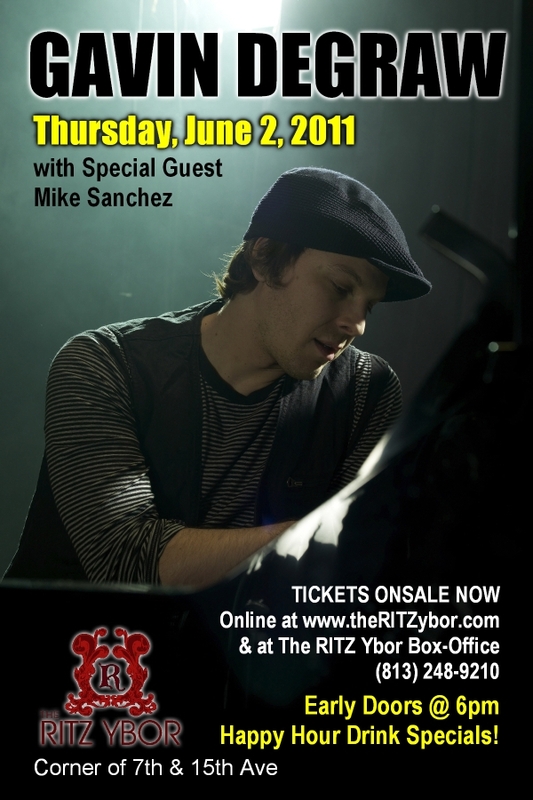 The Ritz Ybor is hosting Gavin Degraw&apos;s only solo Florida show TONIGHT! Special guest Mike Sanchez will be the opening act. Gavin is known for his hit-singles "I Don&apos;t Want to Be," Chariot," "In Love with a Girl," "We Belong Together," and "Follow Through." He is going to be touring with Maroon 5 and Train in July and August as their supporting/opening act. In addition to touring all summer, Gavin&apos;s fourth studio album called "Sweeter" will be released in early August. While his new single from the album is due out this month. Tonight doors open at 6 and the show is tentatively scheduled to start at 8pm. General admission tickets are $20 and are available online and of course at the Box-Office. So if you&apos;re looking for Things to do in Tampa Bay tonight, here&apos;s your answer. Head on over to Ybor City and enjoy an awesome show. That&apos;s all for me, but check in later for other Tampa Florida Events!